When modeling in Google SketchUp, you may need to create terrain. Whether you’re modeling a patch of ground for a building or redesigning Central Park, you can model terrain from existing data, which usually arrives in the form of contour or topo lines. You know the squiggly lines on topographical maps that show you where the hills and valleys are? They’re contour lines (or contours) because they represent the contours of the terrain. Sometimes, you have contour lines for a building site that you want to model in 3D. You can use the From Contours tool in the Google SketchUp Sandbox to automatically generate a three-dimensional surface from a set of contour lines. 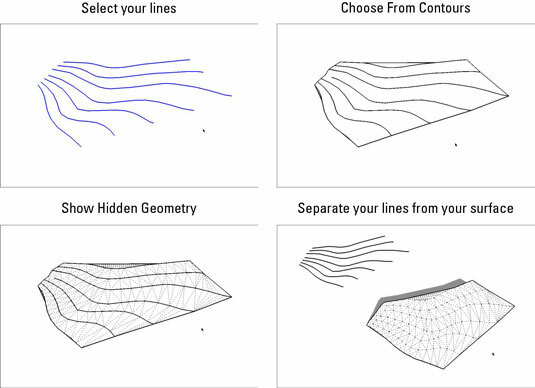 Select all the Contour lines you want to use to create a surface. Choose Draw, Sandbox, From Contours from the menu bar (or click the From Contours tool button, if the Sandbox toolbar is visible). Your contour lines need to be lifted up. The From Contours tool creates a surface from contour lines that are already positioned at their proper heights in 3D space. Most of the time you work with contours that were part of a 2D drawing, and that means you probably have to lift them up yourself using the Move tool, one at a time. It’s tedious but necessary. Just oil up the Select tool, put on some music, and get to work. You end up with a group. When you use From Contours, SketchUp automatically makes your new surface (the one you generated from your contour lines) into a group. It leaves the original lines themselves completely alone; you can move them away, hide them, or delete them if you want. To edit the faces and edges inside a group, double-click it with the Select tool. To edit your new surface, turn on Hidden Geometry. The flowing, organic surface you just created is actually just a bunch of little triangles. The From Contours tool smooths the edges that define them, but they’re there. To see them, choose View, Hidden Geometry from the menu bar. Work on a smaller area. Creating only what you need is good modeling policy. Use only every other contour line. Doing this effectively halves the amount of geometry in your resulting surface. Dumb down the contour lines. 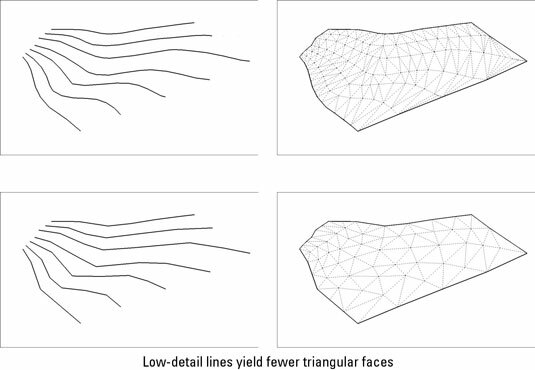 The From Contours tool works by connecting adjacent contour lines together with edges that form triangles. How many triangles it creates depends on how many individual edge segments are in each contour line. Unless you created the contour lines to begin with, you have no control over how detailed they are. You don’t have to start with existing contour lines. In fact, drawing your own edges and using From Contours to generate a surface from them is one of the most powerful ways to create organic, non-boxy forms in SketchUp. Get ready to do some cleanup. The surfaces that From Contours creates usually need to be cleaned up to some extent. Use the Eraser to delete extra geometry (you’ll find lots along the top and bottom edges of your surface). Use the Flip Edge tool to correct the orientation of your triangular faces.